« Tom Lehrer at 90! Sorry it’s a bit crumpled, but I guess that demonstrates the authenticity of its provenance. The full story, as it appeared in the print edition of the Western Mail, can also be found online here. By the way it’s me on the stepladder, pretending to know something about astronomical instrumentation. I wrote at some length about the background to the cancellation of the Clover experiment here. In a nutshell, however, Clover involved the Universities of Cardiff, Oxford, Cambridge and Manchester and was designed to detect the primordial B-mode signal from its vantage point in Chile. 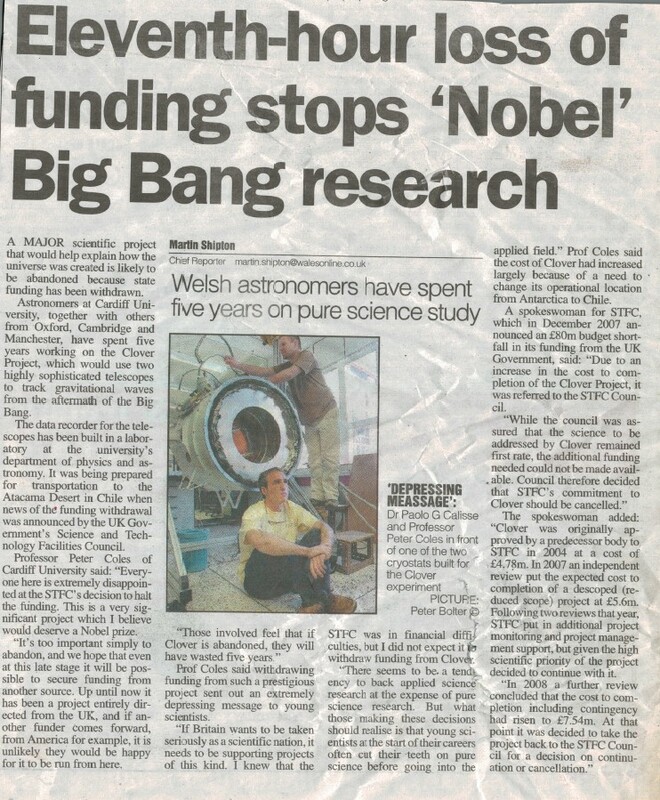 The chance to get involved in a high-profile cosmological experiment was one of the reasons I moved to Cardiff from Nottingham almost a decade ago, and I was looking forward to seeing the data arriving for analysis. Although I’m primarily a theorist, I have some experience in advanced statistical methods that might have been useful in analysing the output. It would have been fun blogging about it too. Unfortunately, however, none of that happened. Because of its budget crisis, and despite the fact that it had already spent a large amount (£4.5M) on Clover, the Science and Technology Facilities Council (STFC) decided to withdraw the funding needed to complete it (£2.5M) and cancel the experiment. I was very disappointed, but that’s nothing compared to Paolo (shown in the picture) who lost his job as a result of the decision and took his considerable skills and knowledge abroad. We will never know for sure, but if Clover had gone ahead it might well have detected the same signal found five years later by BICEP2, which was announced in 2014. Working at three different frequencies (95, 150 and 225GHz) Clover would have had a better capability than BICEP2 in distinguishing the primordial signal from contamination from Galactic dust emission (which, as we now know, is the dominant contribution to the BICEP2 result; see thread here), although that still wouldn’t have been easy because of sensitivity issues. As it turned out, the BICEP2 signal turned out to be a false alarm so, looking on the bright side, perhaps at least the members of the Clover team avoided making fools of themselves on TV! P.S. Note also that I moved to Cardiff in mid-2007, so I had not spent 5 years working on the Clover project by the time it was cancelled as discussed in the newspaper article, but many of my Cardiff colleagues had. This entry was posted on April 10, 2018 at 11:35 am and is filed under Biographical, Science Politics, The Universe and Stuff with tags 9th April 2009, B-mode, Bicep2, Clover, Cosmic Microwave Background, Cosmology, Polarization, Science and Technology Facilities Council. You can follow any responses to this entry through the RSS 2.0 feed. You can leave a response, or trackback from your own site. “It would however, have had the same difficulty as BICEP2 in distinguishing the primordial signal from contamination from Galactic dust emission” – that’s not quite right. BICEP only observed at one frequency (150GHz), so it didn’t have the frequency information that would have let it identify dust emission from CMB emission. On the other hand, Clover had 95, 150 and 225GHz, so would have been able to distinguish between the different components (caveat sensitivities at different frequencies). Quite so. It had the same problem (disentangling primordial B-modes from dust), but was in a better place in principle to solve it. Have now corrected. What is a “DEPRESSING MEASSAGE”?